More Zombies is an interesting action game developed by TANOKU. This game has simple graphics, suitable for all ages. You can experience this game on your browser because it is a flash game. In this game you are a hot dog vendor and you have to kill the zombies. This game has many different missions, each mission is a challenge for you. You will have to kill the zombies in the park, in the subway, in the street ... 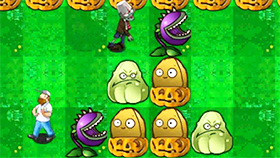 Note: There are many different types of zombies, each with different abilities. You will have an HP bar, when you are attacked by zombies, the HP bar will decrease. When the HP bar is reduced to 0, you lose. The interesting point in this game is that you can collect items on the road (these items will appear randomly), such as weapons, health ... You can use 5 different weapons to kill zombies. Story: This mode has many different missions for you. Zombies will appear in waves and you must destroy them all. Survival: You must destroy all the zombies and try to survive. Defender: Defend your hot dog cart against a zombie invasion. Time Attack: Kill zombies as fast as you can. Use K and L to attack.